Parmjeet Gill has been the owner of a small business for 9 years. Mr. Gill is an active volunteer in the Maples community. 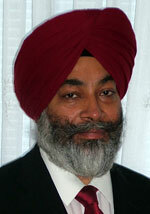 In 1998 he helped found the Sikh Volunteers Association which organizes annual blood drives. He also is the fundraising chairperson for the $7-million Manitoba Sikh Cultural and Seniors Centre, to be built on the corner of Fife Street and Redwood Avenue. Mr. Gill is also active in various other cultural and sports organizations, and was an active participant in efforts to protect the community during the 1997 Red River flood. Since joining the Liberal Party of Canada in 1989, Mr. Gill has been active in several election campaigns including those for former MP Dr. Rey Pagtakhan. In addition, Mr. Gill has served as Vice-President of the Liberal Party of Canada (Manitoba). Mr. Gill is 44 years old and has been a resident of Winnipeg for over 15 years. He and his wife Balvir have three daughters Navdeep, Ameet, and Gurvir.